In today’s age of smart phones and instant gratification, convenience is the name of the game. People know what they want and when they want it. And it’s usually right now. If you’re in a rush and need to pick up some coffee or lunch but don’t want to wait in line, most stores let you order ahead with an app. You can get most items you buy online shipped to you in 2 days at most, and some will even arrive the same day! Convenience can come with a cost, however. There is a lack of personal interaction and uniqueness behind every transaction. You can have your coffee ready for you as soon as you walk in the door, but you don’t have to make eye contact with anyone or enjoy an actual conversation. We want it all and we want it now. And we’d rather not interact with a person if at all possible. There is a company that is able to offer convenience while keeping the values of conversation and quality alive. 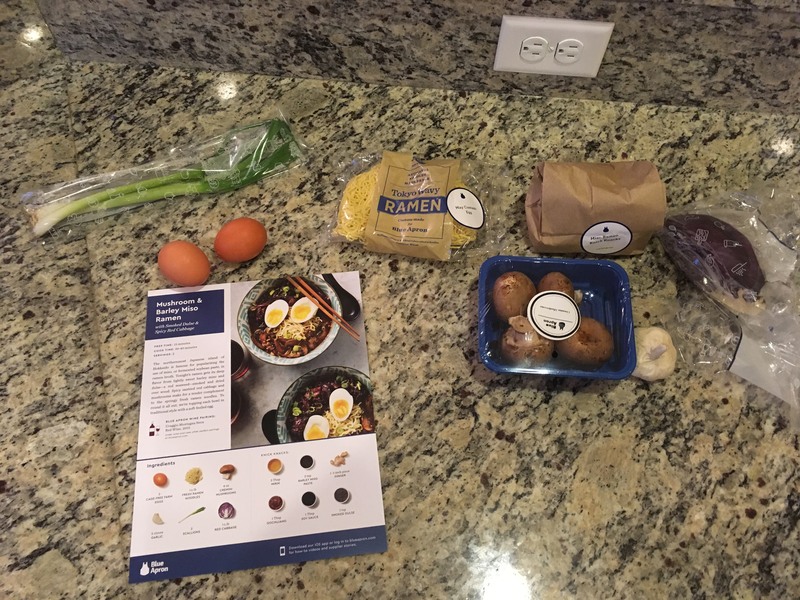 Blue Apron is a meal delivery service that ships ingredients for delicious and healthy meals right to your doorstep. Very convenient. But the meal is not made for you. Each meal comes with an easy to follow recipe that any couple or family can work together on. This provides a great opportunity for family bonding and good old conversation, all while allowing you to prepare a healthy and delicious meal. But how does it work? I will walk you through my experience with my Blue Apron step-by-step review, and show you exactly how easy and fun it really is. The process of ordering online was very easy. I just had to select what type of meals I was willing to receive (beef, chicken, seafood etc) and then picked a day for the order to arrive. I chose seafood and veggie dishes. 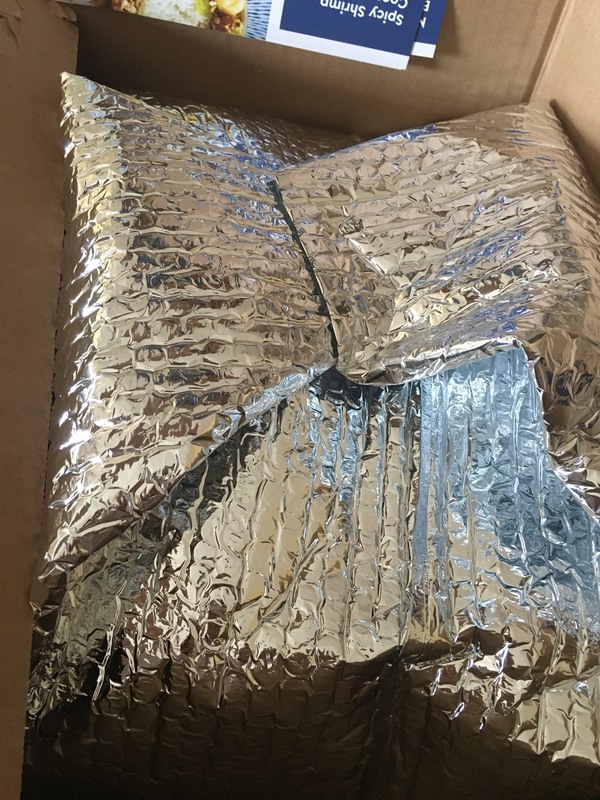 The box arrived on time and with the ingredients nicely wrapped. 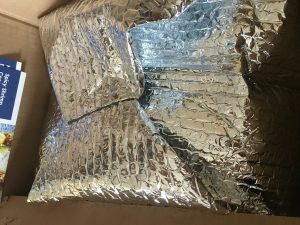 There were big ice packs in the box as well to keep everything cool. Great idea since some people won’t be able to put all their ingredients in the fridge right away. 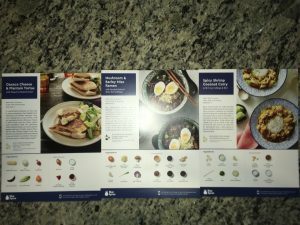 The shipment also came with three recipe cards for the meals. The cards explain what ingredients are in each meal and give an informative explanation on the origin of the dish. They had the recipe instructions on the back along with estimated prep time. We chose the Mushroom and Barley Miso Ramen to start with. Looking at the recipe card, it was easy to go into the fridge and locate all the required ingredients. Now came the fun part: cooking! 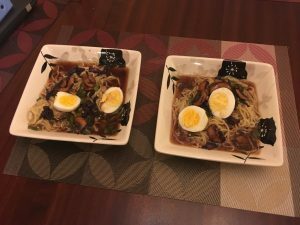 The recipe was easy to follow and fun to make. My wife and I worked together on it, with some help from our little boy. It was some good quality family time. The instructions made it easy to figure out what to do with each ingredient and when to do it. All we had to do was follow along. The ramen meal was delicious! It looked almost exactly like the picture on the recipe card (in my opinion anyway) and it tasted great! Another helpful thing Blue Apron does is to give the nutrition facts associated with each meal. So we knew that not only was the meal delicious, it was healthy as well. 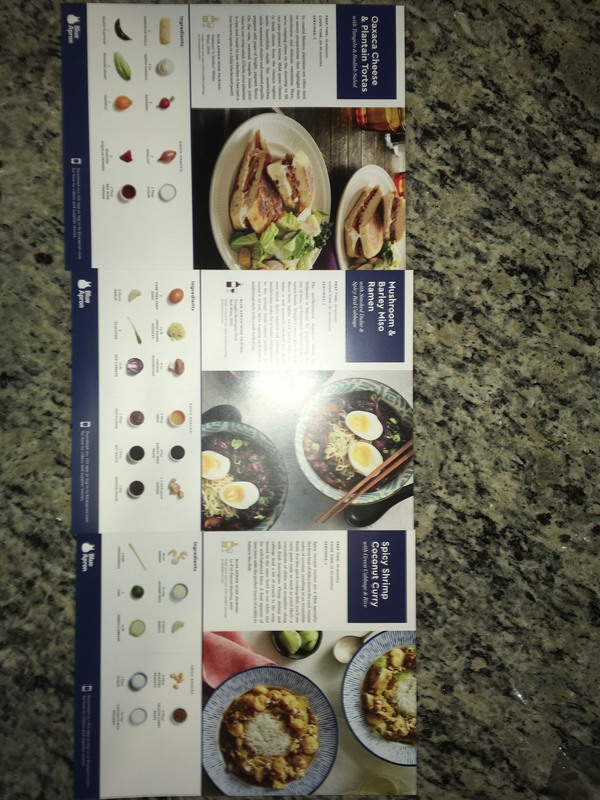 Cooking a meal from Blue Apron was a great experience. The recipe was very easy to follow with step by step instructions and the end product was delicious. We were able to eat a healthy and delicious meal which we would have otherwise probably never tried on our own. I highly recommend it for families who would love to cook healthy food at home on a consistent basis but cannot seem to find the time. If you want to try out Blue Apron too, use our link to get $30 off your first order! Then you can write your own Blue Apron step by step review to let us know how it turned out! Photos courtesy of Syed Hussain.